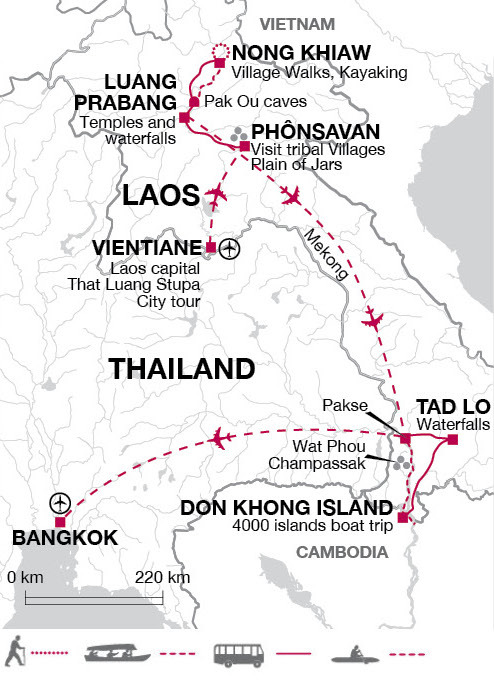 Due to the continual aerial bombardment during the Vietnam War, Laos is the most-bombed country in the world. Many of the bombs dropped didn’t detonate, and unexploded ordinance (UXO) is a real danger to everyday life in parts of Laos. In Phonsovan we visit the Mines Advisory Group (MAG), a fantastic organisation that has helped to destroy some of the 80 million cluster bombs that still remain live in Laos’ fields ,rice paddies and villages. We also visit the COPE museum in Vientiane whose excellent work includes increasing public awareness around UXOs and helping to provide prosthetic limbs to the many landmine victims. The Mines Advisory Group works on a donation basis, which we encourage on the trip. 100% of the donations made at the Visitor Centre is spent on supporting MAG’s work in Laos. Similarly COPE works on a donation basis all of which help the important work that they are undertaking in Laos. All of the hotels that we use are local properties such as the Nong Kiau riverside resort that has just 15 bungalows built to blend in with the natural environment. We only include breakfasts on the trip and you will be eating in the local communities that you visit, thus giving something back to the community and in support of the local environment. In contrast to its neighbours, Laos is still relatively little-visited so the income we bring to this area really helps local development; particularly as we use locally owned services throughout the tour. One of the highlights of this trip is the chance to visit some of the tribal villages. We’ve factored in plenty of time so that we really get a chance to meet the local people, learn about their traditions and daily life and interact with them in a manner which is both insightful yet respectful. Your local tour leader will be a great facilitator in this regard. Buying crafts directly from them cuts out the middle man and enables them to supplement their income in an area where the economic opportunities are few. We are always very sensitive to the impacts of visiting rural communities. One of the reasons we prefer to use local tour leaders is they can give a real insight into the local culture; anything from learning about the education system, to making sure we don’t fall foul of any taboos. It is our policy to generate business and employment opportunities in the countries we travel to by employing local people. All our leaders in Laos are locals and we’ve trained them all too so they are comfortable in their work and you get great service.